Voris continues his ideas on real men. Michael Voris continues my theme on real men in the Church with a twist on this video. He connects the new Church Militant and manhood with the Traditional Latin Mass. Here is the video. .Bishop Hopes will be there on Friday from 7pm-8.30pm, today. The media has become more and more hostile to this peaceful protest against the murder of babies in the womb in Great Britain. The British Pregnancy Advisory Service, which is anti-life, is against bishops being there, but this death-group, which supplies abortion counseling, abortions, contraception, vasectomies and sterilizations, all contrary to Catholic and natural life teaching, is supported by the Department of Health. This group was criticized years ago for sending women to Spain for abortions over 24 weeks. That the Guardian newspaper and others side with such a death-organization, rather than the life groups, shows the prevailing anti-life sentiments in Great Britain. Please pray today, especially. 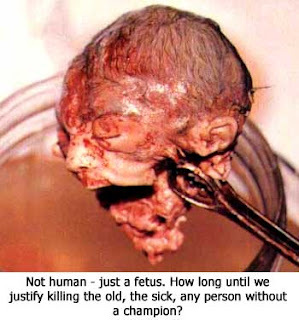 I am using a real photo of a dead aborted baby. If this were a dog or a cat, the person doing these heinous crimes would be in jail for cruelty. Can we call any nation which allows this "civilized"? Arundel. Recently, I discovered that she was a poet in her own right. I have written a poem about her, and here it is. and did not mind the memory? Anne Howard, pray for us.